We love our Student Stories because we get to hear from so many of our amazing students. They all have different paths that led them to Douglas J Aveda Institute. This month’s featured student is Nicole S. from our East Lansing campus. Take a look at her journey to the beauty world and what she plans to do after graduation! The second Nicole walked in the doors at Douglas J Aveda Institute, she knew this was the right place for her. The welcoming atmosphere instantly made her feel at home. She loved being able to meet people and get a feel for the community. “As soon as I walked in, I was greeted kindly. I met the educators and students and everyone was just so friendly!” Nicole signed up for her program at the end of her tour, that’s how confident she was that Douglas J Aveda Institute was the place for her! Nicole really enjoys all the different ways that hair and makeup help people express themselves. This is one of the reasons that hair color has been one of her favorite things to learn and experiment with. Changing hair color has a big impact on a person’s look, and there are so many possibilities! Working with color provides so many ways to play around with appearance. From bright to pastel colors and all the natural shades in between, there’s a lot to learn in the world of a colorist! 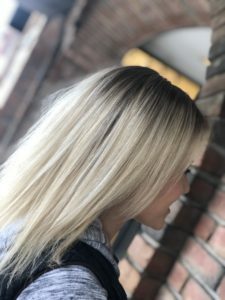 Balayage is Nicole’s favorite technique to practice. 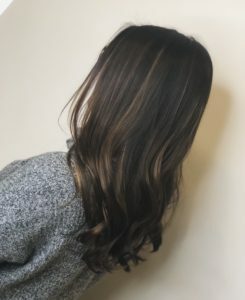 She says there are so many things to learn and experiment with in the world of balayage. One thing she really appreciates about her educators is the opportunities they provide to learn new techniques. She has learned different techniques and formulas each time she does a new color. It really shows how truly unique each coloring process is. After graduation, Nicole wants to focus on doing makeup. It’s something she enjoys and allows her the flexibility to choose her own schedule! Her focus will be in doing makeup for special events like weddings. This can provide her with opportunities to build ties in the community and collaborate with other Instagram professionals! She has already been working on collaborations with boutiques and organizations. Social media is a great place to network and build your brand as a beauty professional. Check out Nicole’s Instagram! If you find yourself in a similar situation to Nicole, unhappy and unsure what to do with your future, have you considered a career in beauty? Getting a beauty education can open so many doors for your future. Take a look at our Career Dreams series to see some of the options! Contact us if you have any questions, we want to help you pursue your future in cosmetology or esthiology!